It’s that weekend between early autumn stakes and the explosive eliminations for the Breeders Crown. The shipping has begun, the top members of all divisions are headed across the border into Canada, where they will take up residence at Woodbine Racetrack for two weeks of the sport’s coveted competitions. What happens this weekend around North American harness tracks is much ado about nothing but only in the matter of stake races. With the major stars parading to the Great White North, all of the usual racing takes place and what stakes are around will be void of big stars. As for the big stars, complete coverage of all the Breeders Crown elims, two nights of them on Oct. 19 and Oct. 20, a week before the finals (all on the same evening) will take place here and at our exclusive Breeders Crown Countdown blog. Shuffle your attention to catch all of the coverage, available exclusively at TwinSpires in cooperation with the Hambletonian Society. We will go over some action on this side of the border and then cover some “Crown” territory, with more reporting linked to the “Countdown” blog. At Flamboro Downs this Friday, Michael’s Power, winner of the Little Brown Jug and one of the top glamour-boy pacing earners of the season, will once again hit the half-mile oval, this time to contest province-breds in the Ontario Sires Stakes (ONSS) Gold Final. Michael’s Power is flawless in ONSS action and is assured a berth in the Nov. 10 Super Final, worth twice the purse of the Gold final. What about the Breeders Crown? Michael’s Power is not eligible. For more about that, see the countdown blog. If you want to key Michael’s Power in the ONSS at Flamboro, then find a few very longshots and hope they complement an exacta or triple because barring any difficulties, the colt wins this race and that will not assure any large exotic pay off. Sans handicapping, take the longest shots if you want to play exotics and hope for a two-digit payoff that isn’t the equivalent of your ticket. A better key for an exotic, on this night at least, is impossible to find. On Friday, Oct. 12, Indiana Downs hosts a trio of $30,000 events for state-bred frosh- trotters. The first two miles are for the fillies and there is a single division for the colts. In the first filly field, the well-bred Justice Drive (she is by Justice Hall, whose sophomore colt, Canadian Justice, is headed for the Breeders Crown) will probably be dismissed based on a recent break after a qualifier that returned her to the sires stakes program after a month. Last week’s mis-step ruined the race for her after a fine qualifier. You should toss that one out and give her a shot here from post 1. She has had some tough trips since winning in July, so if she is ready and steady on gait here, there will be a good price. The second filly trot should offer another recent jumper a shot at coming back at a price. Cincinnati Tilly comes back to the top state-bred class where she has been productive. She was second at 15-1 two back against these kinds and has a strong brush that could work best in this field. The colt field includes a number of guys that have beaten one another on various occasions, making for an even group as long as no one goes galloping. Boy Meets Girl K would be the one to watch here. No one was going to beat Sand Royal Blu last week and “Boy” was third in tight quarters against Sweet Justice, who will have to deal with the 8 hole here. The race before that, Boy had a long trip on the outside as an excuse. He could be ready for a big mile here at a decent price. At The Meadows on Saturday, Oct. 13, frosh and soph pacers and trotters that won’t be a part of the Big Noise in Canada battle in competitive fields worth $20,000 each—the Pennsylvania Fair Finals. The Keystone State is adorned with fair meets through the summer and that season produces horses that excel at that level. Those fair champs for 2012 are all present in these finals. None of the fair races, incidentally, offer pari-mutuel wagering. The affairs have purses for competitors but only the finals offer wagering. Thus, bettors are assured the finest of the lower-class ilk carry their wagers to The Meadows. The parade begins with soph-filly pacers with an unfortunate array of horses that equal only five betting entries. A coupled quintet of fillies trained by Roger Hammer bloat this field. Hammer has long been the “king of the fairs” in the state. You may remember him as the driver/trainer of 2005 Hambletonian champion Vivid Photo. With such a munificent herd, we suggest you pass this and move on to the frosh-filly trot. Defeating the top filly trotter in this field, Lady Broadway, is the task of seven others. Classical Love has come close enough during the season to qualify as a threat and will certainly offer a decent price as a probable third choice. Frosh-colt pacers offer a decent performance and price from Coffee Vendor. He has a strong brush, if only one, and he made it too top heavy last time at the Bloomberg Fair. That was a certain wake-up call for improving form and puts him in the thick of it here. 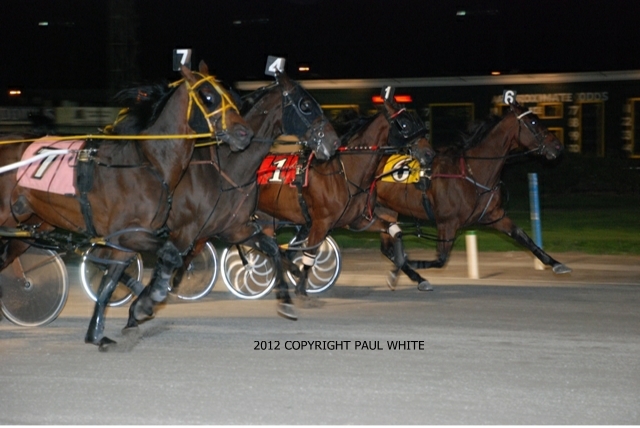 Soph-filly pacers may find the 8 horse aggressive early. Hammer’s Life’sarealbeach is all front-style and will be gunning right from the start. The post insures some value on the toteboard. However, she has to contend with DVC Jaded Attitude, who might save enough ground to fly away from what goes on in the first half. Soph-colt trotters line up for the next final. Whatever happened to Boytown in his last race must be forgiven because he appears to have faced far better than anything here. The good news is that he won’t be the favorite, as Mulligan Bi attempts a hat trick of wins, bound to catch the eye of those bettors not versed in the art of the trip. 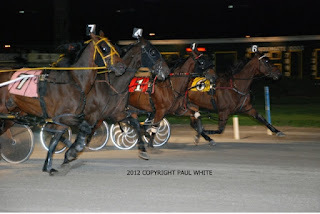 The soph-filly trotters may be victims to Erin Kristen, who has lost her last three with aplomb. Big moves and long journeys have made her the bridesmaid too many times that should have rewarded her with a winner’s circle photo and perhaps with the biggest money of her career on the line she will find a route to get there. The green guys of trotting come next. We offer an outsider, Albany House, to this mix of thoroughly fair trotters. Hammer’s colt may get action due to his profile but we will take that on the chin in lieu of recent performances where the colt has been relentless, especially while dealing with “off” tracks. This could be a shot at getting a great price on a Hammer participant. The glamour-boy pacers of the fair lot close the stakes fiesta with a full field of warriors. Certainly a threat, if not a great price to offer, is Anotherbugga. With a probable choice on the outside (Dalton Hanover), Anotherbugga could be a strong second choice on the board; maybe even the third. He may fire early, control the fractions and make everyone work futilely to catch him. If you go to the Breeders Crown Countdown you will find various news concerning the horses in transit, staying quiet and waiting for the Big Noise. Always check the exclusive blog that, along with the Hambletonian Society and TwinSpires, covers major activity in that could affect the 2012 series of champion-making events, again this year on a single card at Woodbine. Keep up to date on great betting opportunities that don’t appear in the regular TwinSpires blog.